A colour? Yeah, I think it's a colour. Okay let me try to put it this way The paint on my Strarf normal chest is come off and I need some help with the colour(Eh way is it spell color in Gimp an Tfw 2005?) to paint. Other wise I may paint it all black an give it to my Waffebunny. Well, if you want to color-match, you can always go looking through the Games Workshop line of paints (seriously, who needs that many colors)? I know there was a guide to color-matching linked somewhere, but I can't think of where. Also, color is the American spelling, colour is the British spelling. Klinkin wrote: Well, if you want to color-match, you can always go looking through the Games Workshop line of paints (seriously, who needs that many colors)? I know there was a guide to color-matching linked somewhere, but I can't think of where. Okay Thank you vary much for you're help on this. You can't find the exactly match color but you can find look like one. And it is hard to paint with brush, if you don't have skill. If you can use air brush, that will be ok. If you can't use air brush, I suggest that you should find spray can that have nearest color and re-paint every gray color part (or only chest part, but you will have difference color), this will be better than use brush without skill. bang04 wrote: You can't find the exactly match color but you can find look like one. And it is hard to paint with brush, if you don't have skill. If you can use air brush, that will be ok. Okay I'll see what I can find. I'll show what she look like done. Someone on fgsite or a random Japanese image board posted it. Seems like a pretty close match, if not spot on. First let me say thank you very much that is a big help. 2nd Nice Avatar you got there 3rd Do you know where I can get "Mr.Color 117" and "RLM76 Light Blue"? Again thank you. Strarf: Thank you Thank You! You may have just saved me. I really like how they swapped out the black parts to the skintone. She looks great. 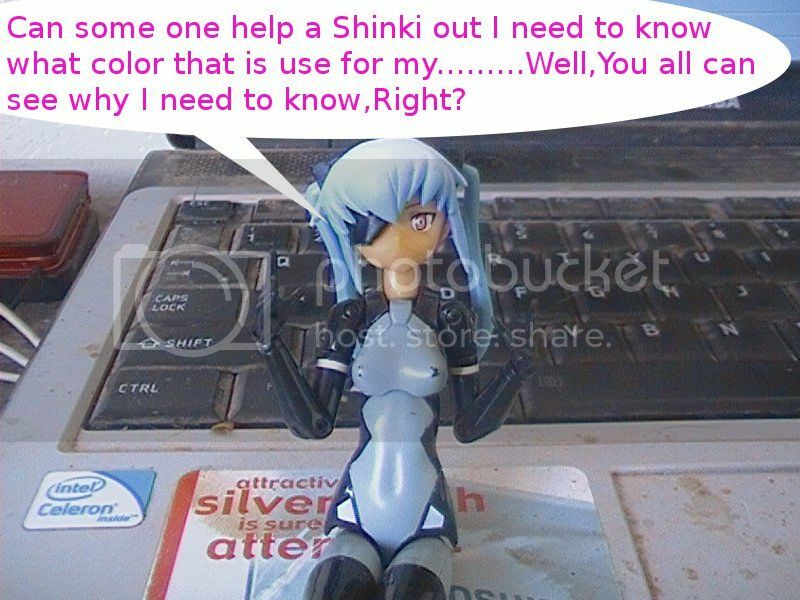 Glad to see you found your needed color, many of the older painted shinki have similar issues but as I recall strarf was more common with this paint issue.